NASA scientists are working to create special deep-space food bars for astronauts on the Orion mission. According to the agency, there are no commercially available bars that would be suitable for this setting, and the food scientists are working to develop high-calorie products that will taste good and help the astronauts keep a healthy weight. 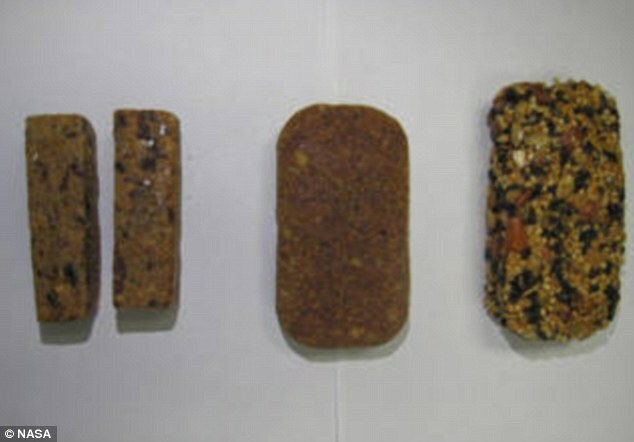 Nasa's food scientists have created a variety of food bars, including banana nut, orange cranberry, ginger vanilla, and a BBQ nut bar – each roughly 700-800 calories. By replacing a breakfast meal with a calorically dense bar, the researchers say they can meet Orion’s mass reduction requirements. On the International Space Station, astronauts have the choice of roughly 200 items for their meals, and even get a special Thanksgiving dinner including turkey, candied yams, and cornbread. This is possible because the crew eats from thermostabilized or rehydratable packages, giving them an array of options. But, the Orion mission must keep its mass low in order to efficiently travel beyond the moon, meaning the supplies will be limited. To work around this challenge, the food scientists have created a variety of food bars, including banana nut, orange cranberry, ginger vanilla, and a BBQ nut bar – each roughly 700-800 calories. For lunch and dinner, the astronauts will have a similar selection to what’s seen on the ISS, along with a food warmer to prepare meals. ‘When you have 700 to 900 calories of something, it’s going to have some mass regardless of what shape it’s in, so we’ve taken a look at how to get some mass savings by reducing how we’re packaging and stowing what the crew would at for breakfast for early Orion flights with crew,’ said Jessica Vos, deputy health and medical technical authority for Orion. 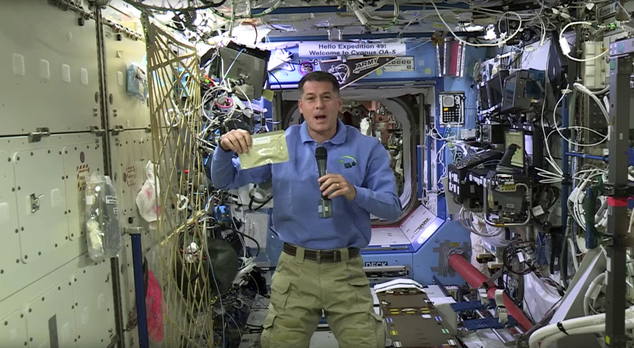 NASA astronaut Shane Kimbrough, the station's commander, is serving as Thanksgiving chef for the six-person crew. He showed off the specialties he'll be preparing in a video this week. On Thursday — a regular workday for the crew — Kimbrough will warm up pouches of sliced turkey, candied yams, and cherry and blueberry cobbler. He'll also add water to the bags of dehydrated cornbread dressing, green beans and mushrooms and mashed potatoes. But, the team has more to consider than the caloric density of the bars alone. They are also working to understand how this type of daily meal will affect crew morale, with food choice, variety, and taste all influencing their consumption habits. ‘There’s no commercially-available bar right now that meets our needs, so we’ve had to go design something that not only works for the crew, while trying to achieve a multi-year shelf-life,’ said Takiyah Sirmons, a food scientist with the Advanced Food Technology team at NASA’s Johnson Space Center in Houston. 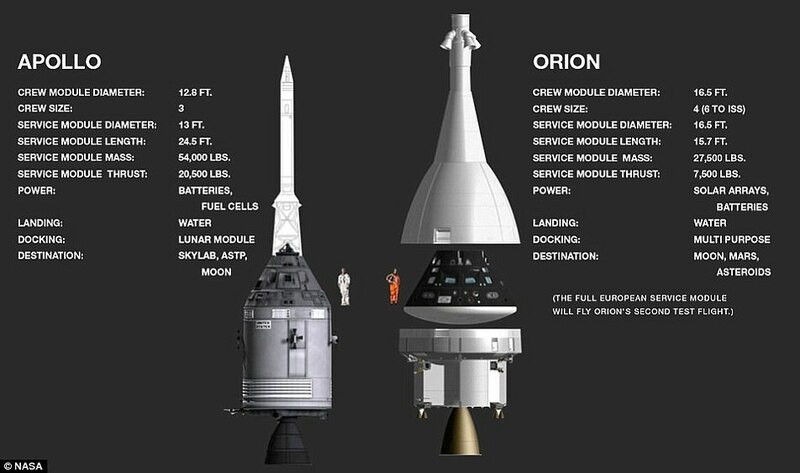 HOW DOES ORION COMPARE TO APOLLO 17? The development of Orion has helped reawakened some of the atmosphere of exploration that surrounded Nasa during the Apollo missions that first landed mankind on the moon. But with almost exactly 42 years between the last Apollo mission, Apollo 17, which launched on 7 December 1972, and the first flight of Orion, the technology has moved on considerably. On the surface the two space capsules look the same - they are cone-shaped, and have a large heat shield to protect the astronauts from the intense conditions during re-entry to the Earth's atmosphere. However, Orion is larger, capable of carrying four crew members rather than Apollo's three. It will also have to carry far more supplies than Apollo ever did. The last Apollo mission saw a two man crew spend just three days on the moon's surface while a mission to an asteroid or to Mars could see astronauts spending up to 450 days in space. Like the Apollo Command Module, Orion has a Service Module attached that houses a single large engine, batteries and storage. However, Orion will carry a pair of solar arrays to help keep the capsule powered in space - technology that Apollo did not use. Orion also uses up-to-date computers, electronics, life support and propulsion systems. The electronics also have a far more sophisticated radiation shielding than the Apollo modules. Nasa has also used some hard lessons to improve the heat shield. Measuring 16.5 feet (five metres) across, it is the largest heat shield ever built for a spacecraft and has been covered in a new material called Avcoat. Nasa has also improved the parachutes, once used to land the Apollo spacecraft and slow the Space Shuttle, to help Orion land more safely in the water when it splashes down after a mission.